GODZILLA is back – or at least on the drawing board. But unlike the rampaging monster the name evokes, this Godzilla is a monster shed. It’s one of a new range of sheds Beverley manufacturer Phoenix Sheds is introducing to the WA market. With pre-engineering approval already ticked off, it is highly likely the company will soon be erecting it for a Wheatbelt farmer with a need to keep his valuable machinery under cover. The shed has been designed as a triple bay drive-through with each span measuring 24 metres (80 feet). Overall it will be 72m (238ft) wide, with a depth of 40m (130ft), providing 2880 square metres of space. The current flagship model is the Titan, which measures 54m x 40m (178 x 130ft) and is designed with three 18m (60ft) spans. The first model was recently erected on Yuna farmer John Grove’s property. He requested a north-facing wall on one of the bays to provide an extra measure of protection for his two headers, chaser and field bin, which stand idle for nine months of the year. According to Phoenix Sheds owner and former Nyabing farmer Ryan Patterson, the company’s new sheds are purpose-designed to cater for today’s larger machinery, while providing the necessary protection from the elements. “On-farm machinery and equipment is a multi-million dollar investment,” Mr Patterson said. “So we see our sheds as providing a cost effective solution to adding extra life, if you like to that investment. Phoenix designs and erects Apollo (15m, 50ft span), Titan (18m, 60ft) and Hercules (20m, 66ft) models. The Titan shed on Mr Grove’s property measures 54m x 40m for a total area of 2200m2 (23,680ft2), with two drive-through bays. Bay one has enough space to house three road trains, bay two is earmarked for the headers (and fronts), chaser and field bins and a John Deere 9570 RX tracked tractor, while bay three will house two air seeding rigs, comprising two 24.2m (80ft) John Deere 1870 Hoe Drills and two 1910 Air Carts, an Agrowplow deep ripper and another 4WD tractor and wheeled loader. With room to spare, thoughts already are focusing on cabinets and shelving for tools and sundry equipment. According to Mr Grove’s son Alex, there will be minimal concreting to the interior of the shed. “We’ll plan a bit for a workshop and storage area and we’ll gravel around it for vehicle traffic,” he said. “It took about 17 days to put it up but it could have been quicker if we had had the pad ready. “When we looked around for what we wanted, this shed design provided us with the most economical price per square metre,” he said. Another plan will be to use the shed for rain harvesting. “It’s a big area to shed water and it will give us a better option for spray water, which will be better than bore water,” he said. According to Mr Patterson, his company also helps its customers optimise the rainwater catchment from installed sheds. “We have a variety of solutions and water tank options for good rainwater catchment,” he said. “It is a good way to go because for every millimetre of rain falling on the roof, there is a significant conversion to the amount of litres you can store. MANY farmers have the do-it-yourself skills and equipment to bolt together a shed frame and clad it. What puts some off is the important bit at the start, laying out the foundations and getting them square and level. Phoenix Sheds WA offers a unique solution, a shed-building masterclass where experts help customers for a day or two on site to lay out their shed and get it right. “Sometimes the daunting part of putting up their shed is getting those foundations right and once they’ve done that it’s smooth sailing to the end,” said Ryan Patterson, Phoenix Sheds WA owner, at the Dowerin GWN7 Machinery Field Days. “We are trying to minimise the cost of putting the shed up, but making sure it starts the right way. “The masterclass is the middle ground between having to pay somebody to put it up and attempting it yourself when you’re not entirely confident,” he said. Phoenix Sheds WA offers a range of easy to install kit sheds to suit various farm applications, but can provide a custom design and full installation service if required. 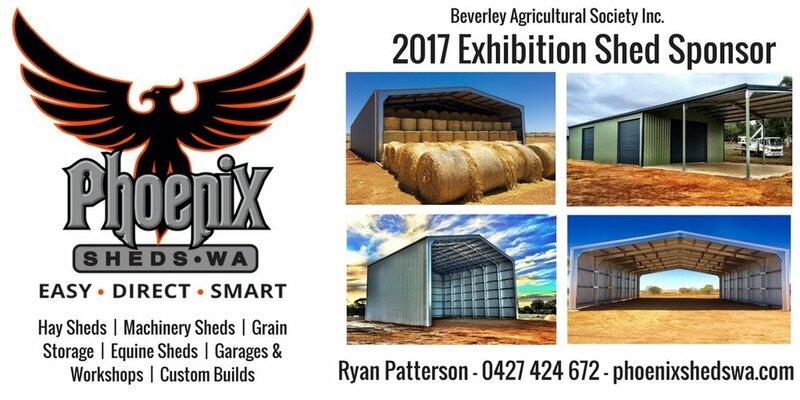 2017 marked the 3rd successive year that Phoenix Sheds WA have sponsored the Exhibition Shed, which is always a hive of activity over the day. Being surrounded by the entrants in the baking and preserving awards made life a little difficult with scones, cakes, jams and chutneys beautifully crafted an on display. We loved the Day, had lots of laughs and met some great new people. Looking forward to doing it all again next year.